I have recently purchased a new type of fishing kayak called the WaveWalk 500 that’s very useful in the waters around here. I can’t tell you how much I am enjoying the W. I wish I would have bought one sooner! I’m also offering kayak trips for those who just want to get out for the day and enjoy the experience. This particular design is more stable on the water than any other kayak I have seen. Plus the amount of storage of these unique kayaks blows them all away, too. Fishing while standing is no problem at all, and they are very comfortable to spend extended time in. You can actually lay down in this one! This has been one the most unusual years I have ever been witness to as far as the weather and the fishing goes. In Northwest Iowa the rains seemed never-ending for a while, especially on weekends. Waters are high all over the area, with levels that have not been seen in a few seasons. As far as the rivers go, these heavy rains have caused a lot of flooding, and as for fishing, it depends on where you live and what you are fishing for. Because of the unstable rivers and muddy waters, the musky and pike bite has been off and on from day to day. Nothing that you can predict with the crazy barometer this year. The bass, crappie, and big bluegills, on the other hand, have been great this year! I have been fishing out of my new WaveWalk 500 fishing kayak and it has been giving me access to waters that others are not able to get to. As a result, I am able to target fish that are not pressured, and it is working very well. It is amazing how much you can see and learn from such a silent , low-profile craft. Fish swim right under you without spooking. Awesome to see! 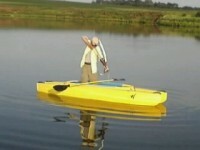 I am now offering kayak trips and kayak fishing through my guide service. Right now I am only able to take one person at a time for kayak bookings, but I am hoping to change that shortly. 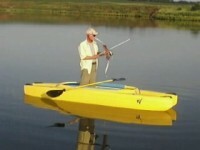 I am also offering bow-fishing trips. You would be surprised how much fun it is to get a 20 pound carp on the end of an arrow. You can’t stop the smile on your face! Once again, from the kayak I can only do one at a time, but there are other options, too. I am also offering fishing lessons and classes for small parties or large groups. I have been certified by the State of Iowa DNR as an official “Fish Iowa” Instructor. So not only do I get the honor and privilege of introducing many people to the sport, but this also gives me access to many of the materials the DNR makes available for young or new fishermen, promoting our great fishing in the State of Iowa! I am proud to introduce the latest in my line of terminal tackle. It is another leader, but geared towards finer fishing. This product came up as a result of a day of walleye fishing where the big pike were biting me off every other cast. Not a major problem, but I was after walleye that day, not pike. But walleye will not take to the sight of a heavy leader and it seems a little silly to cast a curly-tail jig on one too. So I went home that night and came up with what I will use from now on when casting for walleye during aggressive feeding. The snap is of my own design again, with nothing to open or close, changing lures in an instant. Whether you fish for bullheads or musky, it is great just to get out and enjoy a little of what nature has to offer. Biggest bluegill caught in Iowa – unofficial state record. I caught this fish from my W kayak. What a fantastic story! 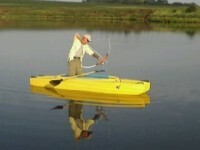 The bow fishing adds another dimension to the activities one can enjoy from a truly stable watercraft. The wonderful things you have to say about Wavewalks are made all the more impressive when someone goes to your website and reads your bio and customer testimonials. So glad you are part of the growing Wavewalk family. But seriously, it looks great! I thank you for your safety concerns about tandem use. I am picky about who goes out in the W500 with me. There is a certain way to do things that has been working out very well. Large people are not showing interest in kayaking, they want the bigger boat. Most of the people I have taken in the kayak are not large, so no problems there. The way we work it for bow-fishing, the person in front stands and shoots the bow, the person in back is the navigator. This works great! As far as fishing, the client stays seated and fishes in front while I overlook everything from the rear. I have had no issues at all doing things this way. And I still get to cast myself! I am a big one on safety for my clients, if I thought there was any problem at all, I would not be taking them out. A little common sense can go a long way also. Not much of that left in today’s world it seems sometimes. So all is well! And again I thank you for looking out for our well-being. It’s nice to know some people really do care! I forgot to mention that I have explored the option of other kayaks, even before I bought my W500. I was not impressed by any of them. There are a couple that are no doubt usable, but nowhere near as convenient for one person to handle and move around with. My plan is to add at least one more W500 to my inventory. I am just waiting for business to pick up. I know where I can get cheap kayaks right now, but nothing I would care to have clients in or around. I won’t risk my name on shoddy equipment. Like the old saying goes, You get what you pay for! I am sure it won’t be an extended wait before my W500 fleet starts to grow! I am looking forward to it!